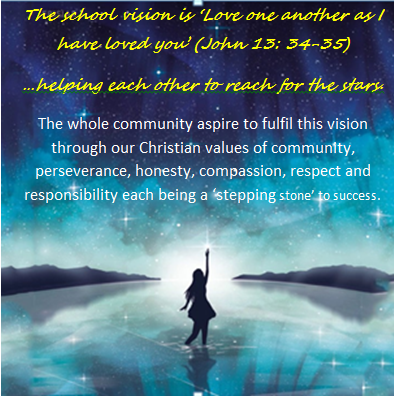 Love one another as I have loved you’ (John 13: 34-35) helping each other to reach for the stars. Welcome to our website. Our school was founded in 1871 and remains today a small, friendly school where all feel welcomed and supported. Strong positive relationships underpin all that we do. We believe that our school is a special place, where children can learn, develop and thrive in a happy and nurturing environment. Our ‘Skills for Life’ approach is a foundation for our curriculum and underpins all aspects of school life; providing pupils with the skills they will need to be lifelong learners. Every child is encouraged to achieve the best that they possibly can by 'reaching for the stars'. We strongly believe that helping children reach their full potential is a shared responsibility and that with our help, their parents’ help and with the help of their peers they will get there. Our aspirations for the children's development are rooted in the Christian values of community, perseverance, honesty, compassion, respect and responsibility. The years at school are few and precious, and our dedicated team offer a high level of individual attention and guidance, so that all make progress whatever their starting points may be. We hope that this site will give you a feel for our friendly and vibrant school, and we encourage you to visit us to find out more.